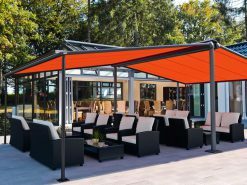 Freestanding awnings allow for large sun and rain covering without the requirement for mounting to a wall. 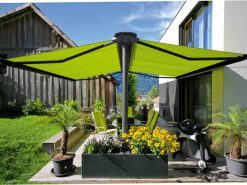 There are two types; butterfly awnings which have a two legged central framework stabilised with either concrete foundations (Markilux Syncra 2 Fix) or stabilisation boxes (Markilux Syncra 2 Flex), and the Markilux Planet which has a single support leg fixed to a concrete foundation. 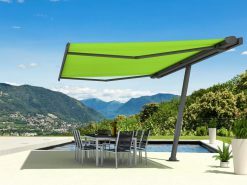 The prices for our freestanding awnings below are for the frame only. 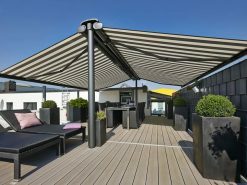 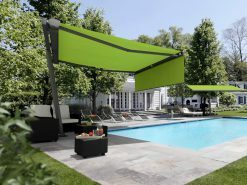 All of the products are compatible with any of the Markilux retractable patio awnings. 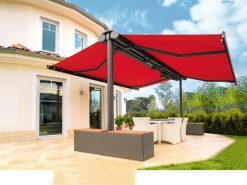 The Syncra 2 Fix is also compatible with a Markilux Pergola fabric roof veranda awning.